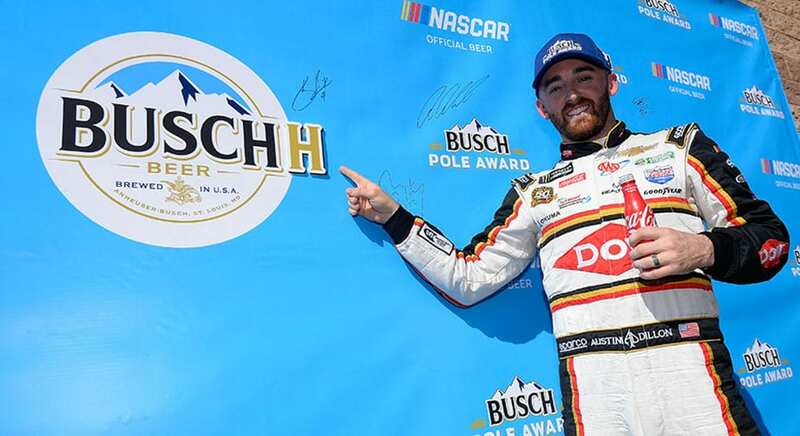 Austin Dillon will start on pole for the Auto Club 400 last Sunday after recording the fastest time in Busch Pole qualifying on Friday. Dillon recorded the fastest lap in what has become a hectic three-session qualifying session before Sunday race (3:30 pm ET, FOX, MRN, SiriusXM NASCAR Radio). It's Dillon's second pole at the Fontana, in California, and his fourth pole position. The qualifying session included a crazy frenzy at the end of each round, as the drivers waited to get on the track in draft groups and did not bring any drivers to reach the finish line in time for a qualifying lap in the third round. This means that the first positions are set by second-round speed. Kevin Harvick will join Dillon in the front row on the 2-mile track. Aric Almirola, Kyle Busch and Joey Logano complete the top five in the starting lineup, unofficial. Every driver except Kurt Busch waited until the final minute of the second round to attempt a qualifying lap. Among those who did not make it to the final stage were Brad Keselowski, Kyle Larson, Erik Jones and Kurt Busch. Defender Martin Truex Jr. was among those who did not advance from the first round, qualifying 27. Roush Fenway Racing's Ford 6 by Ryan Newman failed twice pre-qualifying inspection and chief of car Todd Brewer was expelled from Sunday's race. Newman will also lose 15 minutes of violation practice.